This post may contain affiliate links. You can read my full disclosure policy HERE. Thank you for visiting Life is Sweeter by Design. I found this bunny statue at a garage sale for 75 cents. It was in pretty sad shape, but wasn't cracked or broken. I decided I would try a garden statue redo and see what I came up with! 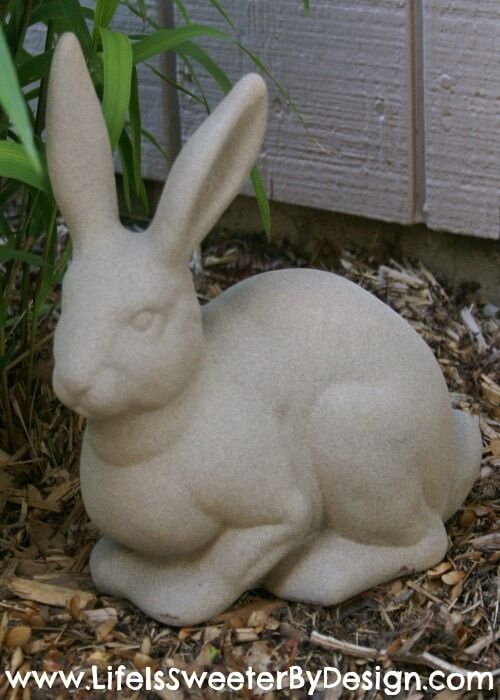 I am not a big collector of garden statues, but thought this bunny would look cute among some of my plants. 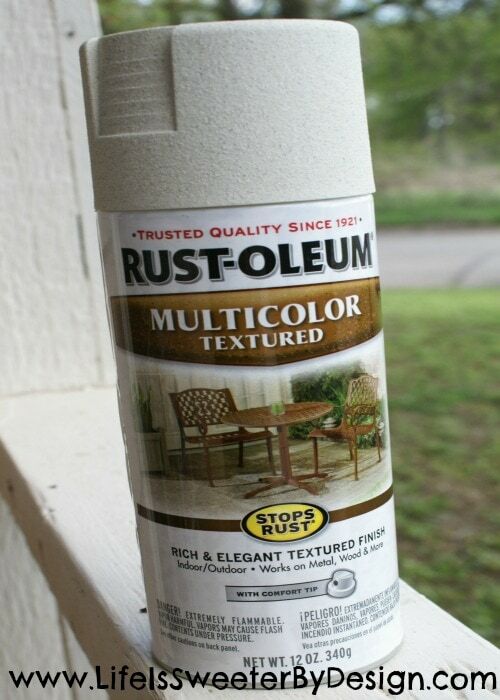 I have developed quite a love for spray paint lately and decided to try using this Rust-oleum Multicolored Textured Spray Paint. The nice thing about this paint is that it is indoor/outdoor and can be used on a lot of different surfaces. 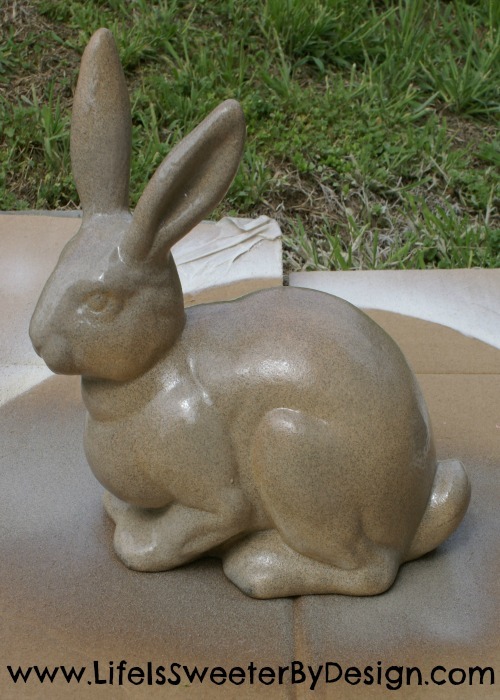 This bunny statue is nice and heavy…some sort of hardy ceramic. I felt like this spray paint would provide a good coverage. I like that it is textured. It gives it a great look! I just plopped the statue down on a piece of cardboard and sprayed light coats. I let the coats dry a little in between. I made sure to get all the nooks and crannies of the rabbit sprayed good. The above picture was taken when it was still wet. It took almost the whole can of spray paint to get the statue good and covered. 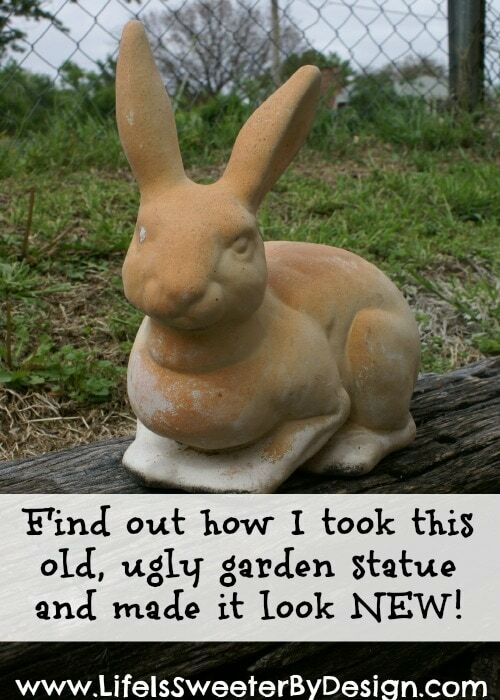 This garden statue redo resulted in a bunny that looks like brand new! I was really impressed with this easy DIY bunny makeover! I think that the cost of the rabbit…plus the spray paint made for a pretty cheap yard decor item! I have seen some pretty expensive garden statues. Have you tried to do any kind of garden statue redo? If so, how did it work? He does look sweeter. I was a bit skeptical since I liked the first photo. Of course, I was skeptical of my husband who did the same thing to our zen person statue. She was green and he used Rustoleum to paint her metallic bronze. She did look much nicer. Great job! Yes..I agree that some people prefer the “loved” look of the rabbit…but I can tell you that the picture didn’t do justice to the rough condition she was in! 🙂 It is amazing what a can of spray paint can do! I would love to see your zen statue! This is a great idea! It would be so easy to update just about anything you find at a thrift store, etc to match your own personal garden style. Thanks so much for sharing! Looks great now good job! Oh wow,that really looks great! I have a couple garden angels that need fixing up like this. Cool! Thanks Rachel! It is so easy!